Bookwork by Uriel Orlow and Ruth Maclennan, 160 pp. A ‘ready-made archive’, a holiday correspondence and a philosophico-anecdotal meditation on history. 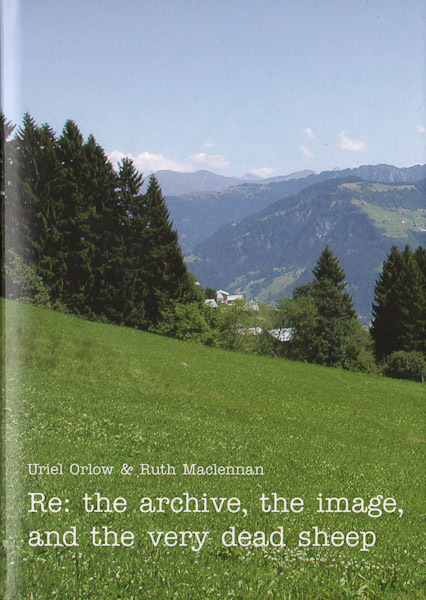 Ruth Maclennan and Uriel Orlow write to each other while on holiday in the Highlands of Scotland and in Zurich and the Swiss Alps. The correspondents draw on documented, anecdotal and imagined histories of their surroundings to produce associative genealogies: mapping thought, image, object and experience. Seeking correspondences between what has been, what might have been and what could arise, they speculate on pre-archival moments and the archive’s aftermath. This idiosyncratic historiography brings together Cabaret Voltaire, Pictish burial mounds, Lenin, Joyce, the Gulf Stream, and the Rosetta Stone. The correspondence is expanded by commentaries, afterthoughts and annotations by Robin Banerji, Finn Fordham, Mikhail Karikis and Nicholas Noyes. The book collates images from personal collections, the internet and museum shops to form an autonomous, yet related image-archive, which generates its own associations and references. This, together with lists of names and terms and a bibliography performs the role of a thesaurical archive-catalogue that provides an alternative entry to the book.